Located in the Far West of Cornwall, at the very south westerly tip of the British Isles is the seaside town of Penzance. As someone who has grown up and spent many years in Penzance I'd like to think consider myself a reliable source of information on most aspects of the town and living here. Penzance has both a fascinating history but remains a lively town whose fortunes have ebbed and waned over the years. 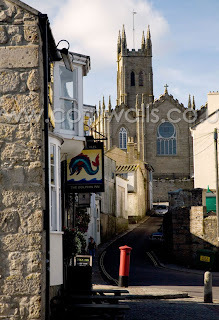 The name Penzance comes from the Cornish 'Pen Sans' which translates as holy head. Whilst the adopted symbol of the town was the severed head of John the Baptist it appears more likely that the town's name refers to a holy headland where a chapel stood over a thousand years ago. Whatever the derivation, there is little doubt that town originated and grew around the thriving harbour. Chapel Street leads from the harbour to the town centre and is oft called the most historic street in Penzance, and for good reason. Amongst its eclectic mix of 17th-19th century architecture are a host of pubs, two churches and a number of curiosity shops. Of these pubs the oldest is the Turks Head, whilst the best known is the Admiral Benbow, the fictitious home of Jim Hawkins in Robert Louis Stevenson's Treasure Island. Of equal historical import is the Union Hotel where in 1805 the death of English admiral Horatio Nelson was announced following the Battle of Trafalgar. With a population of around 20,000 Penzance is a fair sized town. As such it has a reasonable, though not impressive, selection of shops on the curiously named Market Jew Street. There are further, quirkier shops to be found on the adjoining pedestrianised Causewayhead, but more importantly both offer a fine selection of pasty purveyors! Whilst it may be said of every town in the UK, Penzance does seem to have more than its fair share of pubs, around about 25 last time I counted. Whether this is a good or bad point is debatable. 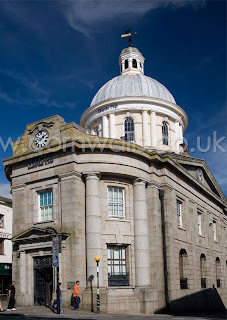 Beyond the town centre Penzance's main features are its sea front with its harbour and the only promenade in Cornwall. The prom, as it is know, stretches for almost a mile towards the fishing port of Newlyn. On a sunny day it is great place to take a stroll and even a dip in the sea. On a force 8 south westerly wind it develops a somewhat different character with waves battering it sending plumes of spray high into the air. Besides the obvious attractions of the town there are a few things worth seeing. Depending on the weather, first on the list might be Morrab Gardens, a sub-tropical garden located between the town centre and the sea front. Once privately owned these gardens are now open to the public and feature an array of sub-tropical plants such as tree ferns, palms, Japanese Bitter Orange and even banana plants. A little way along the sea front from the gardens and at the eastern end of the Promenade is a fine example of an Art-Deco lido, the Jubilee Pool. The pool seems to go through phases of resplendent restoration and woeful neglect, these seem to generally reflect the town's fortunes. In the summer there is a cafe open overlooking the pool which is a great spot to start a sunny day off with breakfast and a coffee. Situated in the next park is the Penlee House gallery and museum. This houses a permanent collection paintings from the Newlyn School with the works of artists such as Stanhope Forbes and Norman Garstin. It also hosts the town museum with exhibits detailing the history of Penzance. The town's other gallery is the equally prestigious Exchange which showcases the very best of local, national and international contemporary art. As with Penlee House there is a pleasant cafe to enjoy a coffee or grab a bite to eat. As one of the longest established holiday resorts in Cornwall there should be no problem finding somewhere to stay in Penzance. Staying in the town centre is one option and there are a range of good hotels and B&Bs around the seafront. If you want the best of both worlds - staying near Penzance but also in the countryside, or perhaps the nearby fishing village of Mousehole, there are a plethora of Penzance holiday cottages nearby and in the surrounding villages that offer good value for money. Wherever you choose, Penzance and surrounds are a great spot for exploring West Cornwall. To the south Penzance is bordered by Mount's Bay with its fairy tale island castle, St Michael's Mount. 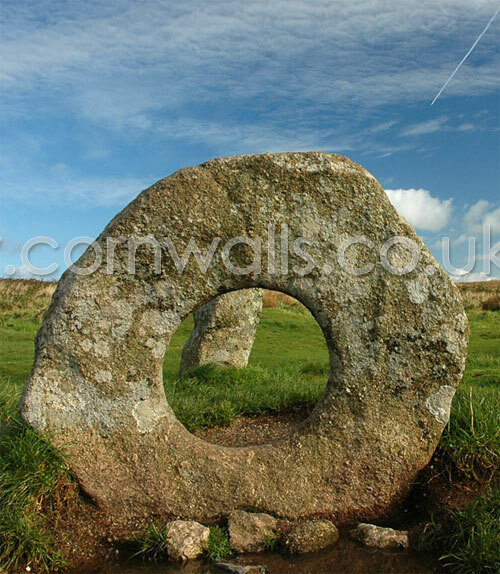 To the north and west are the West Cornwall moors starkly beautiful and littered with the remains of Bronze and Stone Age civilization. Most notable of these sites are the bizarre holed stone at Men-an-Tol and Lanyon Quoit with its huge capstone rested on 3 granite legs. There are also remnants of much more recent history - the engine houses of tin mines, abandoned at the turn of the century when the tin ran out. Just along the coast from Penzance is the fishing port of Newlyn - the largest in England. Despite attempts to 'clean up' and modernise the town around a hundred years ago the higgledy-piggledy Fradgan district still remains with its maze of tiny streets and fisherman's cottages. A few miles further down the coast is the village of Mousehole (pronounced Mowz-ul). Described by renowned poet and alcoholic Dylan Thomas as the loveliest village in England Mousehole lives up to this claim. Weathered granite cottages huddle around the small harbour whose narrow entrance is where the village gets its name. Penzance is also the gateway to the Isles of Scilly which sit around 30 miles west of Land's End. At present Penzance is the point of departure for the daily ferry, the Scillonian III. Unfortunately the heliport which offered a 30 minute flight has now closed. The next best alternative is the Skybus plane service running from Land's End airport around 7 miles away.